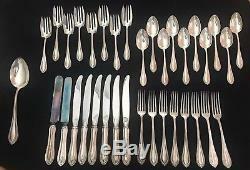 This is a really nice 35 piece set of Watson's King Philip sterling flatware. It is a service for 8 plus a serving spoon and two extra tea spoons. 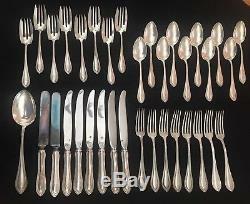 Its all in good condition with normal scratching and wear as you would expect of a set of vintage flatware. There is a very light monogram that shows on some pieces. Some of the hollow handle knives have some dents on the handles. 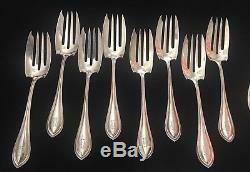 8 - 7 Dinner Forks. 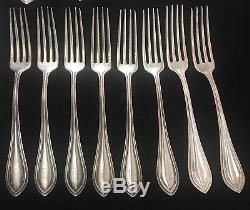 8 - 6 Salad Forks 1.0 Oz. 8 - 8-3/4 Knives: 2- 2.5, 6- 2.7 Oz. 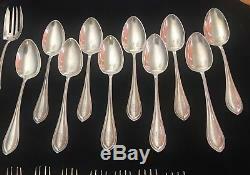 10 - 6 Tea Spoons 1.1 Oz. 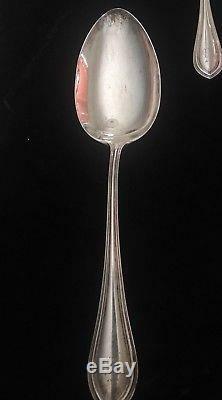 1 - 8 Serving Spoon 2.2 Oz. 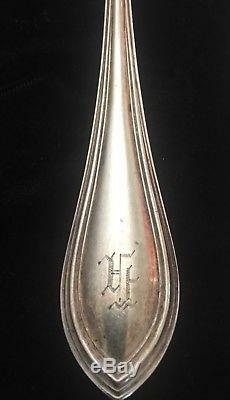 The back mark shows the hallmark of Watson Silversmith of Massachusetts. The pattern King Philip pattern was made beginning in 1904. Wallace bought the company in 1956. Six of the knives are stamped on the blades with Wallace Sterling Handle, Stainless Blade. I believe these where probably replacements they bought after Wallace took over. 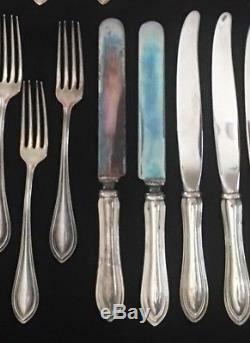 The other 2 are not marked but must have sterling blades due to the tarnish on them. The weight of the 35 pieces is 58 ounces. They arent tarnished much so I havent polished them since everyone has their own preference on this. 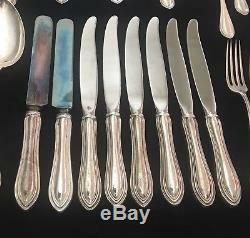 The item "Watson/Wallace King Philip Sterling Silver Service For 8 Flatware Set Made USA" is in sale since Sunday, September 2, 2018. This item is in the category "Antiques\Silver\Sterling Silver (. The seller is "exploringfortreasures" and is located in Albuquerque, New Mexico. This item can be shipped to United States.